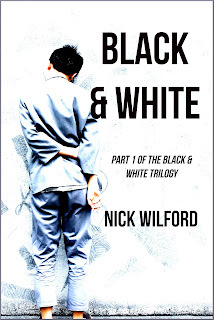 Nick Wilford, Speculative Author: Black & White Release Day and Blog Tour Day 1! If you read and enjoy it, I'd hugely appreciate if you could leave a review to let me know. Your guest post is up and running. Congrats on the new release, Nick. Congratulations! Thanks for a great interview, Nick. Pop on over and have a read, folks. Congratulations, Nick. I wish you great success. Congratulations! I've returned in time for your release! Awesome, Nick! And extra kudos for taking the reader on such an interesting path. Congratulations! Celebrating is a must. Ah so! I'm beginning to connect the dots now. - Well done Nick. Congratulations to you, Nick! I'm off to read the start of your blog tour. What a fun way to kick everything off.